Welcome to our Apex Legends Light Machine Guns List, here you can view the Best Light Machine Guns Stats in Apex Legends. LMGs normal automatic and will unleash a flurry of bullets, one of these bad boys can take down an entire team if used correctly. We display the Apex Legends LMGs using a Tier List format. 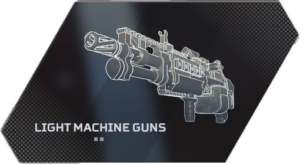 You can find the Apex Legends Best Light Machine Guns in the S Tier, the further down the list the weaker the machine gun ending with F Tier. Below we have a listed each of the Light Machine Guns Stats, such as Body Damage and Head Damage. we also included what attachments can be used for each weapon. -Hop-up 17 34 Full-auto energy.